Every year, to honor those who lost their lives in the line of service on 9/11, members of the Maxwell Learning Community clean up the Firemen’s Park. 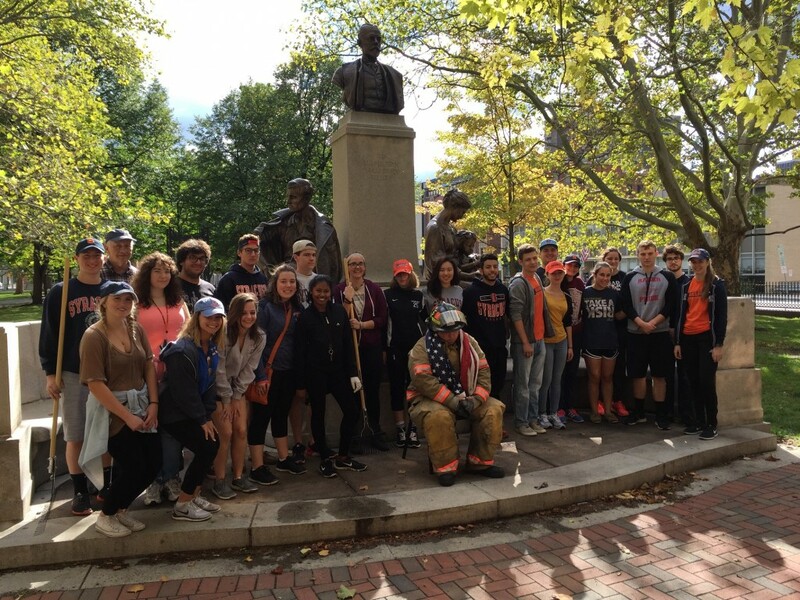 Twenty-five students in the Maxwell Learning Community donned their work clothes and made their way recently to the City of Syracuse’s Firemen’s Park for a special day of community. Every year, to honor those who lost their lives in the line of service on 9/11, members of the Maxwell Learning Community clean up the Firemen’s Park. They were joined by Professor Bill Coplin, who oversees the Maxwell Learning Community. The park was created in memory of those who lost their lives in the line of duty. As part of the city’s effort on that day, a Syracuse city firefighter sits fully suited in silent reflection in honor of those who died on 9/11 (as pictured in the above photo). Firefighters rotate every 30 minutes. Members of the Maxwell Learning Community are encouraged to go outside of the University and act as good citizens in society through community service, a key teaching point through the policy studies program, overseen by Coplin.